Weightier Matters: Foreigners Targeted in Massive Police Raid in S Africa. Scores of undocumented people arrested in stop-and-search mission in Johannesburg in bid to end anti-immigration unrest. Foreigners Targeted in Massive Police Raid in S Africa. Scores of undocumented people arrested in stop-and-search mission in Johannesburg in bid to end anti-immigration unrest. South African police have arrested 50 "undocumented foreigners" in a massive stop-and-search operation in two areas in Johannesburg, authorities have told Al Jazeera. The South African Police Services were joined by members of the South African Defence Force (SANDF) and immigration officials during the raids in Mayfair and Hillbrow. "About 50 people were arrested for being without valid documents in the country," Lieutenant-Colonel Lungelo Dlamini, Gauteng police spokesperson, said on Monday. "It was a stop-and-search operation... It was a normal, crime-prevention operation." Earlier in the morning, local media reported the presence of up to 100 officials, including police officers, in the vicinity. The fate of the arrested immigrants now depends on whether they can prove themselves to have been in the country legally. "Immigration officers are processing those who are arrested, and will ascertain who exactly is illegal or not, and from there they will be taken to the Lindela repatriation centre in order to be deported," Dlamini said. Monday's raids come one week after President Jacob Zuma deployed members of the South African National Defence Force to quell violence in areas of the country that have experienced anti-immigrant unrest. At least eight foreigners are said to have been killed in the past four weeks as violence spread from the seaside city of Durban to Johannesburg. The SANDF refused to be drawn into commenting about the operation. "The police determines which areas need to be dealt with. As you know, we are just a support system for the police," Siphiwe Dlamini, SANDF spokesperson, was quoted as saying by local media. The raids on Monday came after rumours that foreigners in the city have been arming themselves in preparation for further violence. 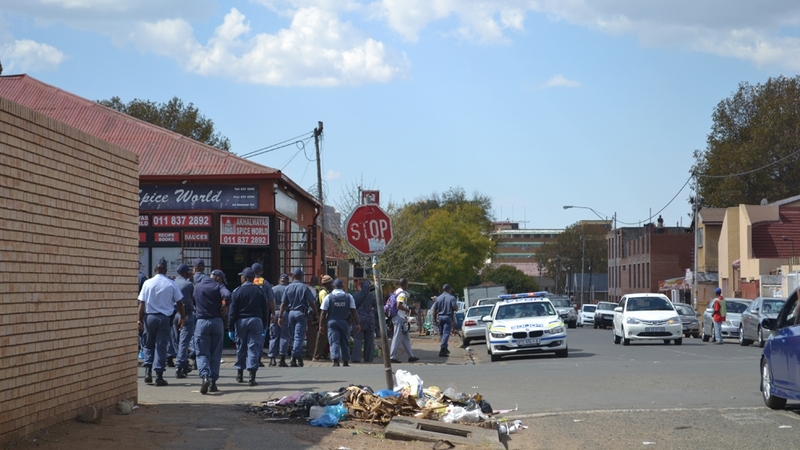 However, police spokesperson Dlamini said no illegal weapons were found during the raids in Hillbrow and Mayfair. Immigrants in Mayfair reacted with panic and confusion at the sight of police and army shoring off streets in the suburb to conduct its stop-and-search operation. One foreign national, Ahmed Fifa, who took refuge in Mayfair after being displaced from the Ramaphosa informal settlement, east of Johannesburg, 10 days ago, said the arrival of the police and army had left the community feeling unsettled. "People became afraid because they have problems from the police before," he said. Researchers too said they were concerned by the inclusion of the army on such raids. 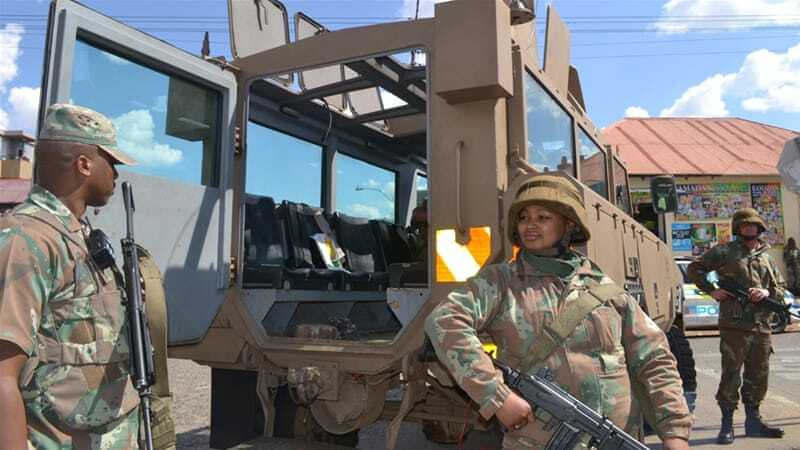 "Soldiers on the streets suggests that government is using very heavy force," said Gareth Newham, head of the Governance, Crime and Justice Division at the Institute of Security Studies (ISS) in Pretoria. "This is not a sight you want to see in a democracy." In Mayfair, however, some foreign nationals said the presence of the army had actually deterred the police from the type of abuses usually associated with operations in these areas. "The way they dealt with this operation was different," said Abdullah Hasan Ahmed, a 37-year-old resident of Mayfair. He says that police officers who usually raid foreigners in Mayfair, demand to see documentation from foreigners without understanding the type of documents refugees hold in South Africa. "There are a lot of people here who don't have identification documents because they have not been given these documents despite living here for years. They are not helped and then the police come asking for documents and they don't even know what documents to look for." The legality of Monday's raids have been questioned by some commentators but experts say the police acted within the law. ISS researcher Newham said it was not unusual for South African security forces to be targeting foreign nationals. "Studies have shown that at least one third of police time is spent targeting foreign nationals, to find whether they are here legally or not," Newham said. "This security operation has shown that the objective is not to build relations with other African nationals but rather it was meant to show South Africans that the force of the state, including the military, will be used to identify undocumented nationals." Some immigrants, however, welcomed the raid to disprove stereotypes of criminality among foreign nationals living in South Africa. Abdirizak Ali Osman, national secretary of the Somali Community Board of South Africa, said the raid was an opportunity to prove foreigners abide by South African law. "We feel the police must come and search each and everyone because there is a lot of misconception about crime and drugs in this area. So the police and the army must come here and see how people are living here, and how they are abiding by the law," he said. Police say the stop-and-search operations will continue in the rest of the city in the coming days. "These operations are continuing and you will see them in other areas," Dlamini said.